I call this recipe for Greek Lemon Roasted Potatoes by another name really. I call them Greek Lemony Potatoes. Chopped, then thrown into a big bowl and mixed with good Olive Oil, lots of thyme, bay leaves, rosemary etc, lemon zest and juice, a pinch of sugar and a splash of water – then tipped into a roasting dish and cooked for 50 minutes (I can smell it now!) – it is a great dish to go with grilled meats, barbecues or roast dinners. Goes so well with Lamb Chops marinaded in olive oil, ginger and a hint of chilli, then grilled. A big splodge of Greek yoghurt adds to the flavours. 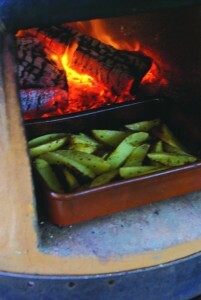 If using ordinary oven, preheat to 200 C/Gas 6/400 F. If using Wood-Fired Oven, oven heat needs to be approx. 550 Degrees F /300 Degrees C.
Either peel potatoes or leave on (I like to leave the skin on). Wash and cut into large, fat chip chunks, and put in mixing bowl. Add oil, lemon rind plus juice, water, garlic, bay leaves, rosemary, thyme, oregano, sugar and seasoning. Stir well. This mix can be prepared a few hours earlier for the potatoes to absorb the flavours, provided the potatoes are well covered in the lemon juice and oil. Tip into baking/roasting dish (because sugar is added, line dish with non-stick foil or similar) - if cooking in Wood-Fired Oven, make sure the dish is suitable and fire-proof, and cover potatoes loosely with foil for first half-hour. Bake for approximately one hour, stirring occasionally, until the liquid is absorbed by the potatoes, and they are golden and crispy. To serve, sprinkle with chopped parsley and the rosemary sprigs (without the stalks). These Greek Lemony Potatoes are brilliant with Lamb, Chicken, Pork, or great with barbecued food. It's one of our favourite potato dishes. Hope you enjoy them as much as we do.